The J'adore round cradle bumper is crafted in luxurious 100% cotton, custom designed for the gorgeous J'adore round sleep system, and offers a luxurious fit and look to your heirloom cradle. Bumper is loomed from 100% cotton cover with a 100% polyester fiber fill. This bumper is constructed in one continuous piece. There are 12 satin ties to ensure a secure fit. Ties should always be positioned outside of the crib and secured tightly and bumper should be removed when baby can sit up or pull to a standing position. Dry Clean only. Dry flat, do not tumble dry. 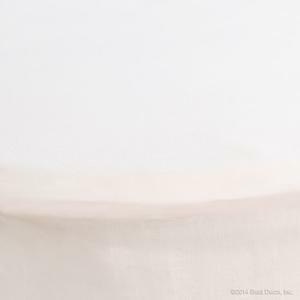 Bratt Decor j'adore round cradle bumper The J'adore round cradle bumper is crafted in luxurious 100% cotton, custom designed for the gorgeous J'adore round sleep system, and offers a luxurious fit and look to your heirloom cradle.